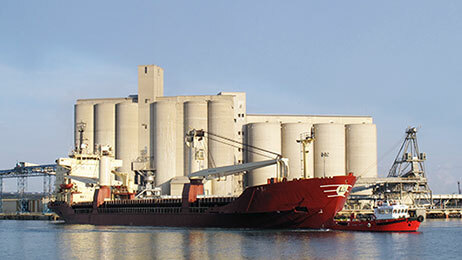 600 to 800,000 tonnes of grain are shipped from Port-La Nouvelle every year, including durum wheat, soft wheat and barley. They are delivered all around the Mediterranean Rim (Italy, Algeria, Greece, Cyprus …). 2 berths for ships of maximum 145 m load x 22 m boa x 8 m draft. The terminal Les Silos du Sud (AXEREAL Group) includes 3 grain silos with a total capacity of 75,600 tons (Silo No. 1 = 32,500 t – Silo No. 2 = 20,000 t – Silo No. 3 = 23,100 t), 2 loading gantries (up to 1000 t / hour), 3 pits for reception by trucks (150 to 300 t/h) + 2 pits for railcars (300 to 600 t/h), 3 weighbridges, 3 truck loading stations for deliveries and 1 chain for bagging (3 double bagging stations with rate from 70 to 90 tons / hour).